Cannonau is vastly underrated. Unfortunately, it's also not exactly plentiful. That's beginning to change as consumers catch on to this delightful value red. Made from grenache on the island of Sardinia, cannonau can take on many different faces, from Barbaresco-like acidity (Sella y Mosca) to smoky, seductive intensity (Nuraghe-Craboni), to simple, fun-drinking whimsy like the one below. So far, I have yet to be disappointed by any of them. 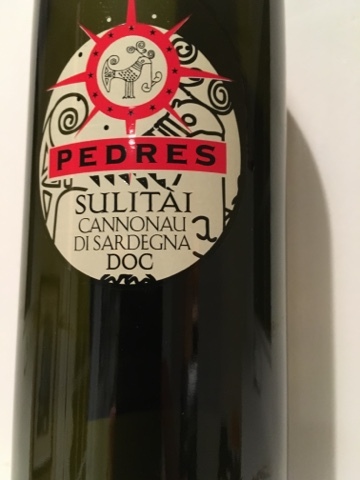 Pedres makes a couple of different cannonaus, the less expensive of which is the Sulitai bottling. Loaded with lip-smacking flavor, this is a terrific summertime wine that will go with anything from lemony pasta to grilled fish. Stick it in the fridge for 20 minutes before pouring. YUM. Added bonus: cannonau is said to have triple the normal levels of life-extending polyphenols. Who said wine can't be good for you?